As calcite (calcspar) occurs in a number of massive forms such as aragonite, marble, limestone, chalk, fibrous etc. The calcite crusher can produce the raw materials in different Mosh hard with continuous performance. The common calcite crushers are jaw crusher, cone crusher, impact crusher etc. In the calcite crushing plant, the run-of-mine calcite is fed into jaw crusher for primary crushing, and then the crushed calcite is transferred to secondary crusher like cone crusher, impact crusher for further crushing. 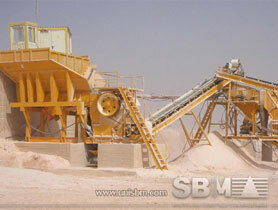 SBM can supply Calcite crusher and pulverizer machine for calcite powder making. Except these calcite powder making machine, SBM can design the process for calcite processing, such as jaw crusher for primary crusher, impact crusher and cone crusher for fine crushing, screen for classification. "For calcite crushing, SBM will be your best choice. Apart from high quality calcite crushers, there are also common spare parts and wear parts provided."